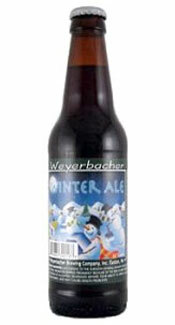 It's no secret that Weyerbacher makes award winning beers and their Winter Ale is one of them. Taking home the Silver Medal at the World Beer Championships this beer is no slouch. This winter ale has everything needed to keep you warm through those blustery winter months with a molasses-like brown sugary sweetness, dark fruity esters of cherries and plums and just enough hops to keep the sweet flavors from becoming too cloying. Appearance: Poured a deep rich mahogany color with good clarity. There was about two fingers of off-white head that fizzled pretty quickly down to a thin frosting of foam leaving behind only some faint lacing. Smell: The smell is about sweet and fruity. Big molasses scent up front with a smell of caramelized sugar and candied fruits. Some dark fruit aromas come through smelling of plums and raisins. Very malty, sweet smelling beer. Initial Taste: Just like the smell the flavor is big on the sweetness and dark fruits. Toasted malts, plums, cherries, brown sugar and a hint of chocolate cut across the tongue setting you up for what is to surely be a sweet beer. But the hops make an appearance with an earthy presence that give the beer needed bitterness and depth. The finish is somewhat dry and subtly sweet. Thoughts: It’s no secret that Weyerbacher makes award winning beers and their Winter Ale is one of them. Taking home the Silver Medal at the World Beer Championships this beer is no slouch. This winter ale has everything needed to keep you warm through those blustery winter months with a molasses-like brown sugary sweetness, dark fruity esters of cherries and plums and just enough hops to keep the sweet flavors from becoming too cloying. And while there is no mistaking this is big malty beer there is enough complexity here to attract even the hardest hop-headed beer drinker. Is it worth venturing out into the snow and ice? Maybe not… but if you happen to find it at your local store I recommend giving it a try. Cheers!